This has been a week of rewatching movies... Two days ago we watched Hot Fuzz over at 504. Tonight we watched (and mocked) Vertical Limit. 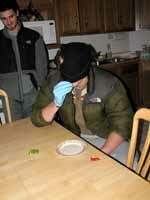 But mostly it was a chance to test Guy's ability to distinguish between red and green peppers. This summer Guy accused me of trying to poison him with red peppers. Apparently Guy hates red peppers (he was there in the grocery store when we bought them... I'm just saying...) I claim that Guy can't actually tell the difference. So we held a blind taste test. Guy was given about five trials. 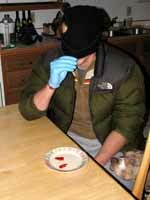 In each trial there were three peppers and he had to simply identify which was different. The results? 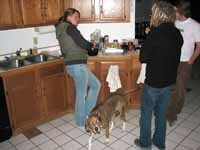 We agreed that both of our arguments had merit. In two of the trials, Guy couldn't tell which was which and selected the wrong pepper as unique. This supports my argument that he can not well distinguish red peppers, and certainly doesn't actually hate them. 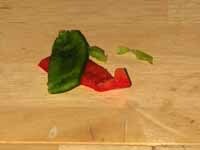 But in two of the trials he was quite certain which were the red and green peppers, and in those cases he was right. This supports Guy's argument that he can tell the difference between red and green peppers. BTW, Marci took the test after everyone left and only missed one trial out of four.